Spaghetti Squash is one of my new favorite winter vegetables. I won’t go as far as saying I’m addicted (it’s only a vegetable, after all). 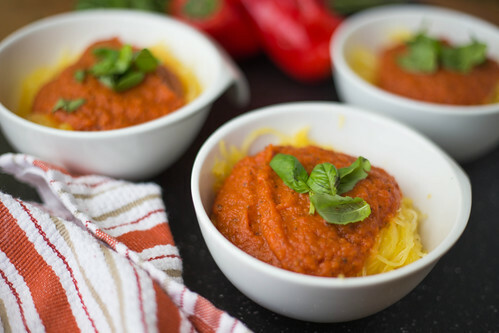 But I really loved the Roasted Spaghetti Squash with Red Pepper – Tomato Sauce that I made a few weeks back, and wanted to try some other spaghetti squash inventions. As I was walking around the supermarket the other night, I saw that broccoli was on sale. Light bulb! Roasted Broccoli is absolutely amazing, especially in pasta (or in this case, spaghetti squash). Something really magical happens to broccoli when its florets begin to finely caramelize in the oven. It pretty much turns into vegetable candy. Adding in garlic and parmesan cheese to the mix doesn’t hurt either. Cut the spaghetti squash in half lengthwise. Be careful with that knife, it’s a little bit of a chore to get the spaghetti squash split in half. I usually utilize the “rocking the knife back and forth” approach a bit while trying to slice through the squash. Remove the seeds and guts. Brush the cut sides of the spaghetti squash with some extra virgin olive oil, Kosher salt, and freshly ground black pepper. Put the halves on a baking sheet, cut sides down, and cook in a preheated 400°F oven. For my small 3-4 pound spaghetti squash, it takes about 45 – 60 minutes. You know it’s done when you can easily pierce a knife all the way through the squash. And just like pasta, the longer you cook it, the softer it will be. Asheley and I personally prefer our pasta al dente, so I err on the shorter side of cooking time to make sure we get that little bite. If you prefer it softer, keep it in the oven for longer. But today is all about the roasted broccoli and parmesan. 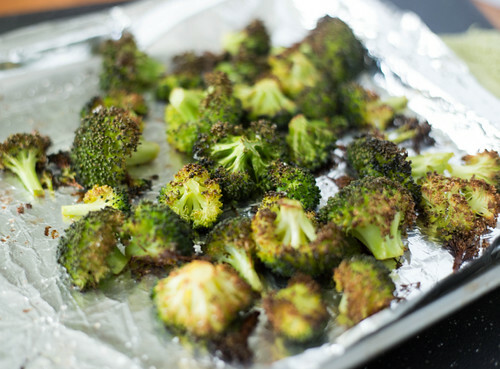 Roasting broccoli is incredibly easy and my favorite way to prepare it. Cut up some broccoli into equal-sized florets (I used two crowns of broccoli). Equal sizes will help all the florets to finish cooking at the same time. Mince two cloves of garlic and toss that with the broccoli, along with about a tablespoon or two of olive oil on a baking sheet. Season with Kosher salt. 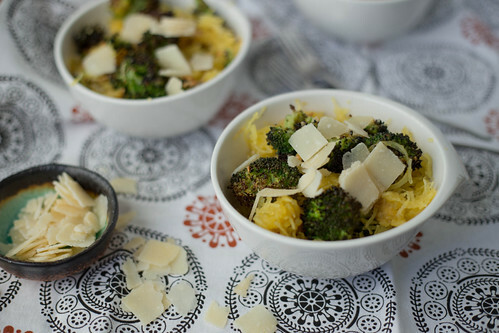 Put the broccoli in the same oven alongside your cooking spaghetti squash. The broccoli only takes like 20-25 minutes, so it should go in later than the spaghetti squash. You want it to all finish cooking around the same time. Enjoy the intoxicating aromas that fill your house while the broccoli and garlic gets all friendly and acquainted in the oven. To finish it all up, melt 2 tablespoons of butter (you can use olive oil if you want, but with all this being healthy, a little butter is a decadent, luxurious reward) in a large skillet over medium-low heat. When melted, add two cloves of finely minced garlic and cook for about 1-2 minutes, stirring frequently. Add a good sprinkling of dried basil (you can use fresh if you have it… I didn’t) and some red pepper flakes if you want a little kick of heat. Add in the spaghetti squash strands, roasted broccoli, about 1/4 cup of grated parmesan, and season with Kosher salt and freshly ground black pepper. Gently toss everything together and serve immediately, topped with some shaved parmesan. Preheat your oven to 400°F. 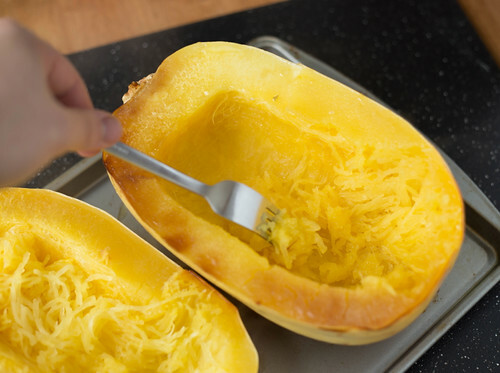 Cut the spaghetti squash in half with a large, sharp knife. Remove seeds and stringy guts, and brush the cut sides of the squash with 1 tablespoon of olive oil. Season with Kosher salt and freshly ground black pepper. Place spaghetti squash, cut side down, on a baking sheet and roast until tender and easily pierced with a knife, about 45-60 minutes. 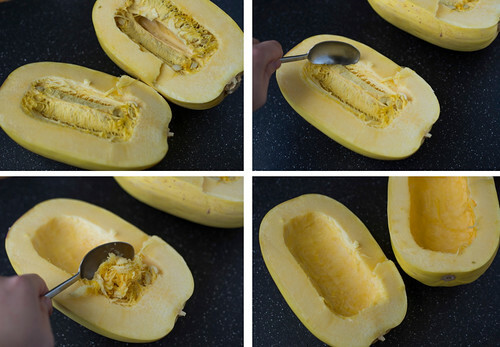 To test if your squash is done, scrap the flesh with a fork. If the strands come off easily, it’s done. Let the cooked spaghetti squash cool for about 5 minutes, then scrape all the flesh into a beautiful pile of spaghetti strands. Taste and season with some more Kosher salt and pepper if needed. Meanwhile, toss the broccoli florets with approximately 1-2 tablespoons of olive oil, 2 finely minced cloves of garlic, and a good sprinkling of Kosher salt. Spread out in a single layer on a baking sheet, and put in the oven during the last 25 minutes of cooking the spaghetti squash. 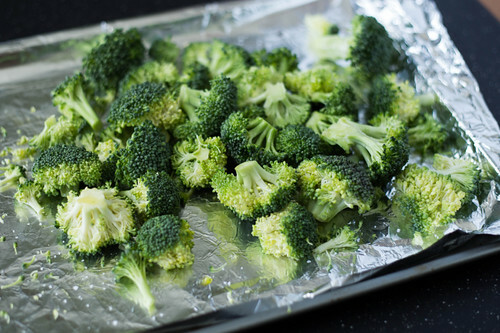 The broccoli should take 20-25 minutes to roast. Melt two tablespoons of butter (you could substitute olive oil, if desired) in a large skillet over medium-low heat. When heated, add the remaining 2 cloves of finely minced garlic and cook for 1-2 minutes, stirring frequently to avoid burning. Add in a good pinch of dried basil and a little bit of red pepper flakes (optional). Add in the spaghetti squash strands, roasted broccoli, and grated parmesan. Gently toss together to combine. Serve immediately topped with additional parmesan cheese. She always looks beautiful 🙂 Let me know how the spaghetti squash turns out! I fell in love with spaghetti squash after having it so deliciously prepared at a vegetarian restaurant, and now I’m inspired to try it at home! This looks so good. Can’t wait to try it! 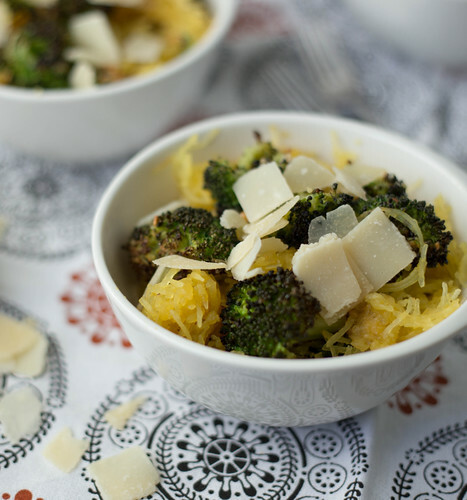 I only recently discovered the awesomeness of spaghetti squash… and now I’m totally addicted!